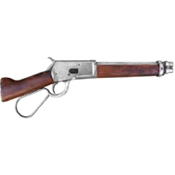 We feature a unique Museum quality collection of Authentic licensed John Wayne Replica Weapons used in John Wayne Movies. Why buy "licensed" John Wayne merchandise? To be certain that it is not counterfeit and that “The Dukes” estate gets their just due. Fair enough I’d say. Our Collection includes the Colt .45 Model 1911 used in John Wayne World War II Movies, Stage coach shotgun used in several of his classic western movies, Looped lever action rifle and 1873 peacemaker used by John Wayne in numerous old west movies. You can get these as individual John Wayne replica weapons or “The Duke”, commemorative John Wayne framed sets. These John Wayne Classic Replica Weapons are a great gift idea for any John Wayne fan or collector. John Wayne licensed M1892 Looped Lever Brass Finish Western Carbine: Features famed looped lever made famous in some John Wayne Westerns. Notice the J W on the stock. A great item for the John Wayne Collector. Complete with wood stock and working lever action. Length: 37”, Weight: 5.5 lb. This custom-designed holster is made specifically for the Mare's Leg replica Item 22-1095 not included with holster. This all-leather holster includes replica bullets as shown. Fits waist sizes 32" to 44" Replica Bullets are included.